Today’s post is courtesy of our board member, Sharlyn Lauby – also known as the HR Bartender. One of the top issues that my colleagues on the Workforce Institute board said will impact workforce management this year has to do with the cycle between human resources, engaged employees and satisfied customers. Research is showing that organizations are ready to make investments in those areas that will help increase employee engagement. Because engaged employees deliver better customer service. And better customer service improves the bottom-line. Those investments will be in areas such as training and development, benefits and compensation, and rewards and recognition. According to India Lossman, product manager at Kronos, organizations are using gamification strategies to reward and recognize employees when it comes to time and attendance. Gamification is the concept of using game mechanics such as incentives, rewards, and healthy competition to promote desired behaviors. A common example is the gamification techniques used in fitness bands (i.e. Fitbit, UP24). According to Gartner, for businesses to successfully engage employees using gamification, the activity must have three things: 1) clear objectives, 2) be meaningful, and 3) create change. Now, use that idea for attendance. Employee attendance is critical to the business. If you haven’t seen the study conducted by Kronos and the Society for Human Resource Management (SHRM), you can check it out here. It specifically addresses the impact that absenteeism has on the business and on the other members of the team. When employees are late, it impacts the operation. Employees aren’t ready to greet customers. Employees have to shift their schedules to cover for someone. Productivity suffers when employees aren’t at work when they’re supposed to be. Design leaderboards showing team attendance. When everyone comes to work on time, they can start working right away. It has a positive impact on productivity. Allow teams to see who’s performing at a high level. Give employees the opportunity to see how they are performing. Create an attendance performance scale (i.e. amazing, excellent, great, good, okay, etc.) to give employees some sense of how they are performing. Provide managers the ability to recognize excellent results. Instead of putting managers in the position to chide employees about being five minutes late, put them in a position to recognize employees for their continued excellent attendance. 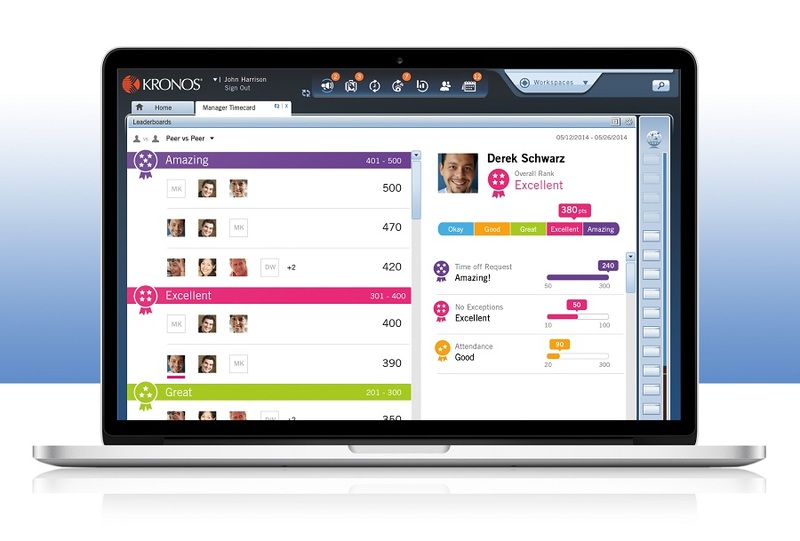 During a demo of Kronos’ gamification module, India shared that companies are using the leaderboards to promote core values that are important to the company, things like completing time cards accurately and arriving to work on time. They are also using the leaderboards to inform employees about safety goals such as number of days without an accident. India says initial customer feedback is that the intuitive user experience and modern design are creating a level of engagement not seen in the past. We all know the most effective way to change employee behavior is by using regular feedback. There’s nothing saying that regular feedback has to be in the form of face-to-face conversations. Gamification techniques, such as leaderboards, allow employees to see where they stand at any given moment in time. In addition, this allows managers to focus their coaching conversations on recognizing good performance. As a human resources professional, I’ve dealt with a lot of employee relations issues during my career. I’ve investigated bamboozling, hanky panky, and even some malarkey. But the number one employee issue I’ve dealt with is tardiness and absenteeism. Yep, attendance issues. Employee attendance is one of those issues that when it starts spiraling out of control, it’s so hard to stop. Gamification strategies could be the way to help employees improve their productivity and create a higher level of engagement with the organization. – in recognizing attendance remember OSHA does not like reward programs for not being hurt; you must adjust to FMLA absences; the ADAAA may come into play and of course in Unionized it must be negotiated (and it will be ineffective). – Supervisors must be trained on how to recognize good behavior and attendance problems. Positive reinforcement by occasionally saying “Thanks for being here on time/all the time” will mean more than other awards and is free. The other side is how to recognize those that are absent or late without breaking some DOL regulation. – Most individuals with chronic attendance problems unrelated to health issues will only change if the alternative, discipline, makes the pain to great. – If you don’t ask them “why” you will never really know, so it takes direct communication that is proper and legal. My experience is that “gamification” is hard to sustain and seen as a “program” and not an ingrained culture, and only those that already have that good culture will get the rewards. These rewards can be done verbally, and of course at review/pay increase time. Next Next post: Deflategate Hits the Workplace – Where is Everybody?